News & Stories > Blue Sky Science > How are robots and humans similar? 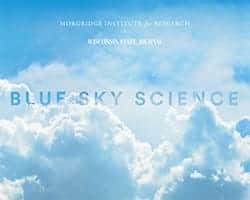 Blue Sky Science: How are robots and humans similar? Robots can be similar to people, but they aren’t necessarily so. People create the robots and can choose what aspects of functionality and design are important, but there are some benefits you get out of similarity. Generally people work better in environments familiar to them, and it’s easier to make sense of technologies that look or behave in recognizable ways. Replicating human behavior is a very challenging and complex process. Researchers often break things down into components such as speech, eye contact or a certain movement, then can work on those specific elements. To start, researchers try to identify patterns that humans display and attempt to replicate those patterns. It’s not an exact human behavior, but it’s a human-like behavior. The uncanny valley is a circumstance when a representation of a human—whether it be a robot or characters in a movie or something—is very close to human-like, but it’s not quite right. It’s close, but just short of being human-like that it starts being very creepy. The goal is to figure out how to provide the kinds of benefits that robotic technology can provide without falling into the valley and eliciting these negative feeling about robots. From computers to the internet, robotics can be the next big jump in technology. They can do physical tasks and be present in our environments. If you think about a computer, it can’t bring you an item if you’re in need. A robot can. The embodiment of a physical presence gives a lot of different benefits in relation to engagement and social presence. There are many interesting and unique applications that can be brought into the world and robotics holds a lot of promise. How do we make robots?